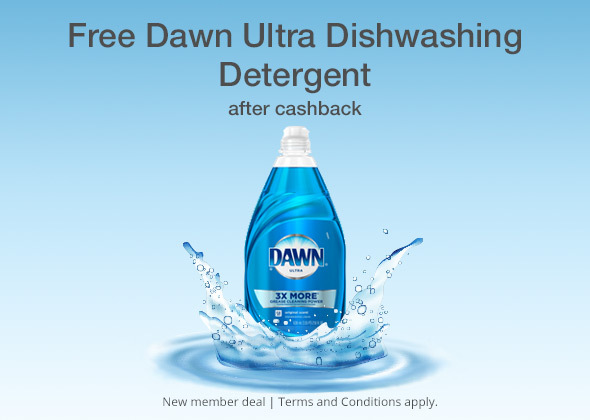 Top Cash Back is offering FREE Dawn Dishwashing Detergent after cash back! Purchase the Dawn Dishwashing Detergent for $6.12 or more at Walmart via the custom TopCashback Offer Page, get $6.54 in cash back! This is for new Top Cash Back members only. 2. Once you’ve successfully signed up, you’ll be redirected to the Dawn Dishwashing Detergent Offer Page. Click ‘Get Offer Now’. 3. Purchase the dishwashing detergent for $6.12 or more at Walmart + anything else and checkout. 4. Within 14 days, your account will be credited with your FREE $6.54 in cash back! 5. After you receive the $6.54 payment in your Top Cash Back account, you can choose to transfer it to your bank account or Paypal. Offer is valid through the September 11, 2017 — or while supplies last! So don't delay!! I use Dawn Dishwashing Detergent. It is a terrific product and this is a good deal. Me too, I love how well it cleans!